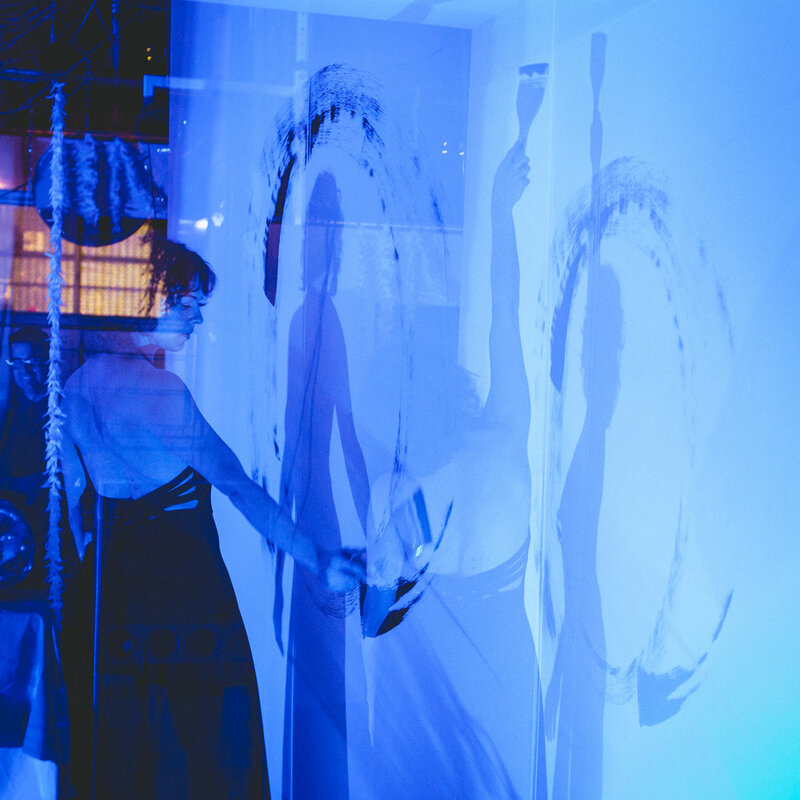 Live window installation performance with musician Kevin Friedrichsen in a multidisciplinary communication experiment. 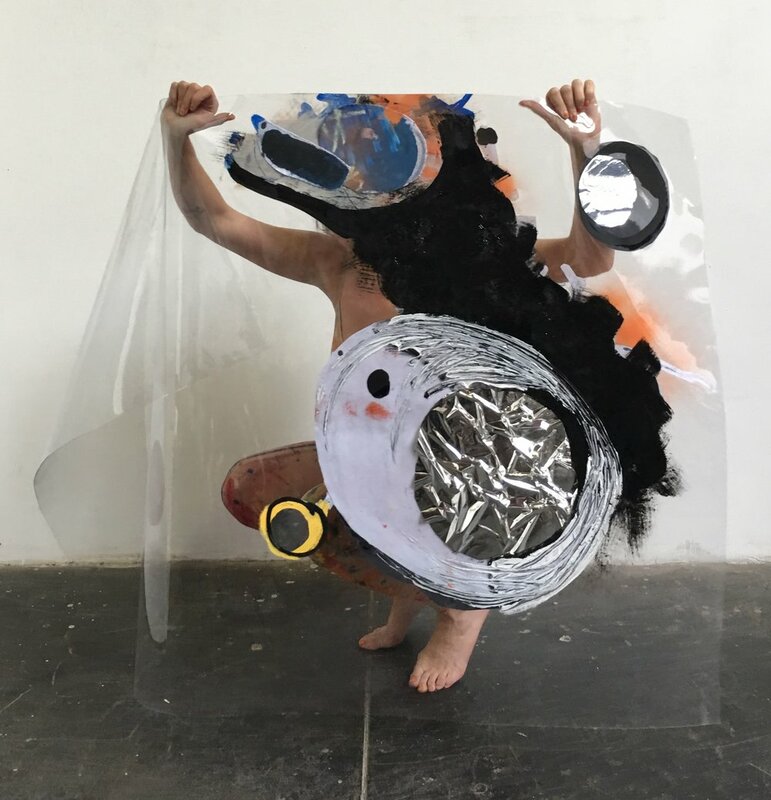 Alexa constructs and deconstructs various lenses to view and be viewed, while Kevin composes modular synth loops, in a live conversation of body & material and technology & sound. Photography, Ben Jackson. Art residency and show exploring the creative power of process. The residency evolves into several phases which layer together for the installation performance. 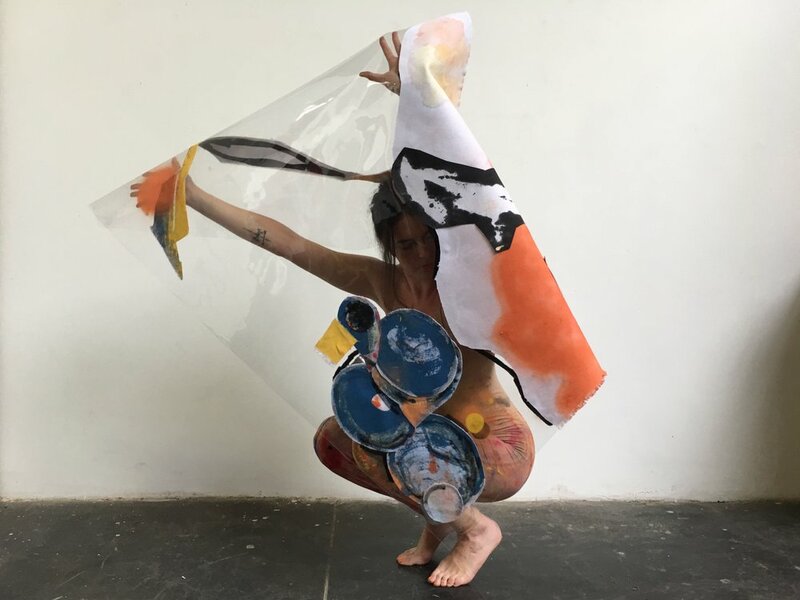 Practices include: Brazilian painted body ritual, dance painting, cutting painted canvas, collaging cut canvas onto plastic panels, and arranging visual elements with the body. Experimentations of objects and bodies. Exercises included, reflecting on the object as body, the material of body, and inspiration from Picasso faces. Alexa creates an installation combining fact, secondhand information, and personal memory into a present experience of historical fantasy. She investigates history as an edge between knowing and a recognition of something yet to be discovered. Inspired by her grandfather’s story, a Jewish immigrant who fled to the US in 1939 from Nazi Germany, she wore his bowler hat and visited locations he lived and traveled, which became part of the video installation. The event theme centered on process. In response, the installation performance invites viewers to participate as they like, ranging from spectator to collaborator. The piece integrates dance and painting. The event theme points to environmental decline, over population, and food issues. In response, the installation performance invites viewers to participate, and offers food objects as stamps and brushes. The piece integrates dance, painting, mixed media, and video. 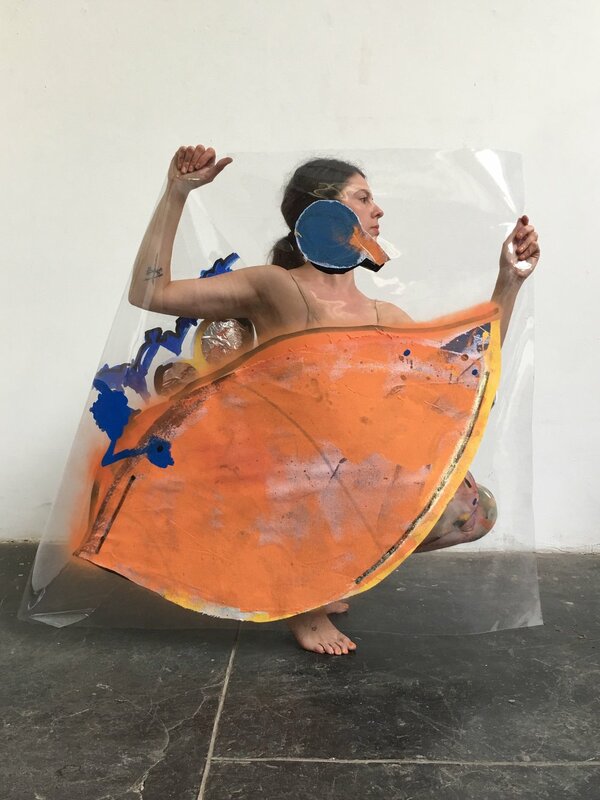 Exploring the boundaries between things, the installation performance of dance and painting inside a box, creates an interaction between inner and outer landscapes. Performance integrating the body with technology into an organic machine. Through dance the body becomes a live ink press. Invited to represent one of the four directions, the producing trio Creator(Conceptions) creates an installation for the South, which pointed to the deforestation of the Brazilian Amazon. Alexa painted the mixed media murals inspired by the topography of the Amazon, and incorporated natural materials such as moss and bark. A material dance with musician Kevin Friedrichsen who plays live modular synth. 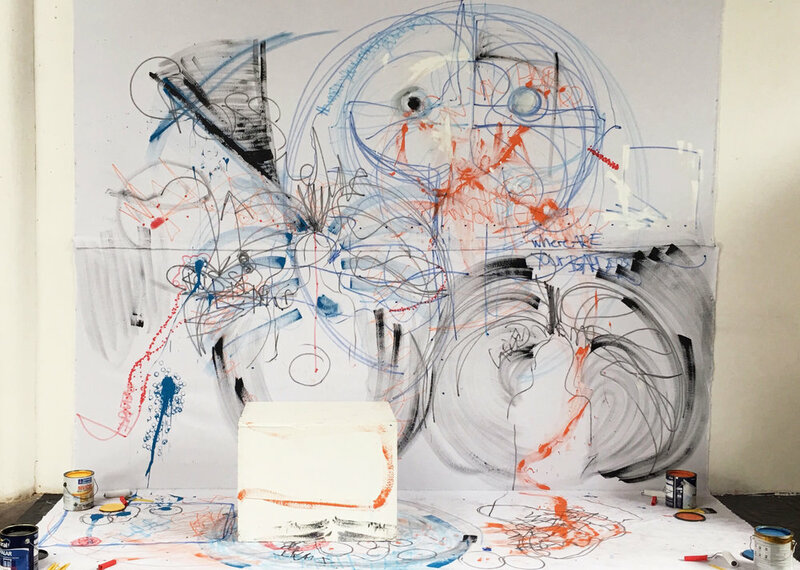 The process unfolds from dance drawing, leading into collaging the drawing, and then photographing collaged layers, including found sound cables.